We like to give credit where credit is due especially within the digital media world and ‘they say jealousy is the highest compliment’. In this particular situation ‘they’ would be 100% right! Over our years of scouring the net for impressive digital media campaigns and after consuming so much digital media daily that our eye tests have to be booked in every six months, we have to say that this campaign is right at the top. Theres something smart yet smug about this digital mechanic and we think that the smug part comes from the incredible audience engagement rate that this campaign provides. We are not talking a few seconds or even a couple of minutes like most marketeers crave but instead HOURS. Yes thats right you read that correctly, hours of engagement and what seems like endless stress to get you across the line and within the ‘100 club’. We don’t want to give the game away entirely but a word of warning, do not attempt to start playing with this media unless you have some serious time to put aside, especially if you are competitive and determined! What we also are impressed with is how this particular mechanic has lent itself to three other games within the same style. We will let you have a google on that one but we just wanted to let all of our network know about a real quality piece of digital media created by a business that has abundance of talent and brainpower at their hub. 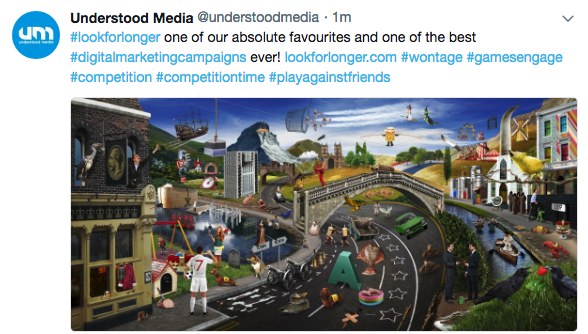 We feel that if we can recognise the talent and quality that other businesses bring to the industry it will lead to us raising our own game and understanding yet another cornerstone of how to create impressive creative marketing.